Discover excellence without expense. The basyx by HON seating collection delivers exceptional value. 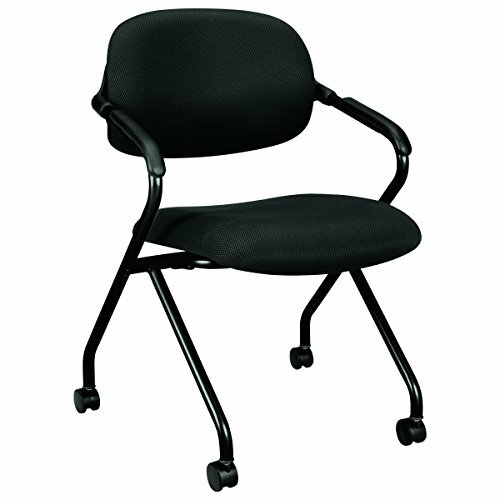 Offering maximum comfort, support and functionality, basyx chairs also minimize the impact on the small business budget. basyx by HON seating has solutions for every part of the office, from the lobby to the executive office. Comfort adjustments can adapt to almost any body type and work function. This HVL303 nesting chair with arms has a distinctive, fully upholstered floating back. The upholstered folding seat and four legs with casters make this chair easy to transport and store. Mesh fabric color is Black and frame color is Black. If you have any questions about this product by basyx by HON, contact us by completing and submitting the form below. If you are looking for a specif part number, please include it with your message.